Lukshon reinvents the dining cuisine “Asian Fusion.” Lukshon delicately and tastefully infuses the tastes I love from Southeast Asian cuisine with modern American dishes. Wayne and I were first hooked when we came for dinner during dineLA. Heart it so much that another time I dined both lunch and dinner in the same day! 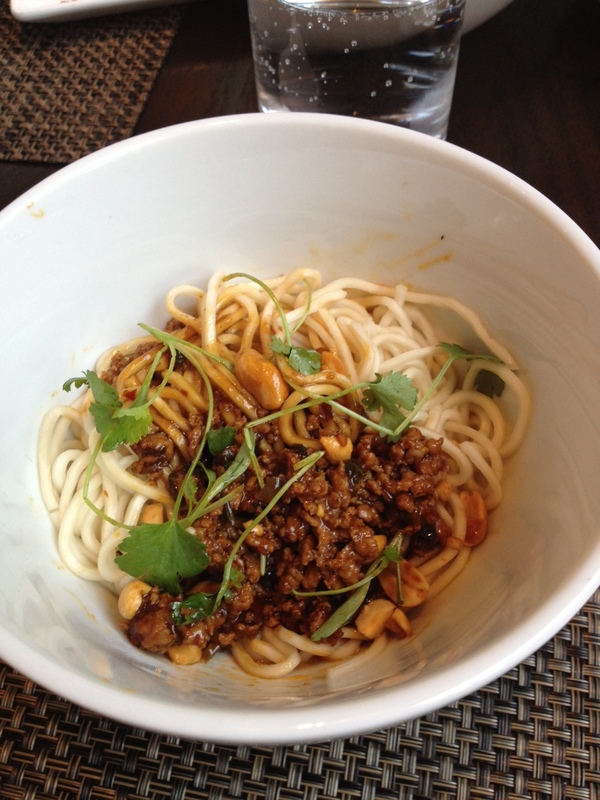 Over the years we’ve seen Lukshon on the dineLA list and–it certainly fed to impress! Lukshon plates are a mixture of small and large plates and served family style. – Tea Leaf Salad – loved the flavor, texture and ingredients in this salad! Slivers of crisp cabbage, the crunch of toasted marcona almonds, peanuts and chana dal peas–I couldn’t put my chopsticks down! I shoved it into my mouth. – Crispy Soft Shell Crab – I’m happiest eating fried foods, crispy soft shell crab especially. It was served with some sambal kecang (peanut sauce) and corn. – Spicy Chicken Pops – what’s more fun than eating food on a stick? These chicken pops were beautiful. The meat was sliced and peeled back from the bone to create a lollipop-like look. These drumettes were tastefully covered in garlic, kecap manis (Indonesia sweet soy sauce) and spicy sichuan salt. 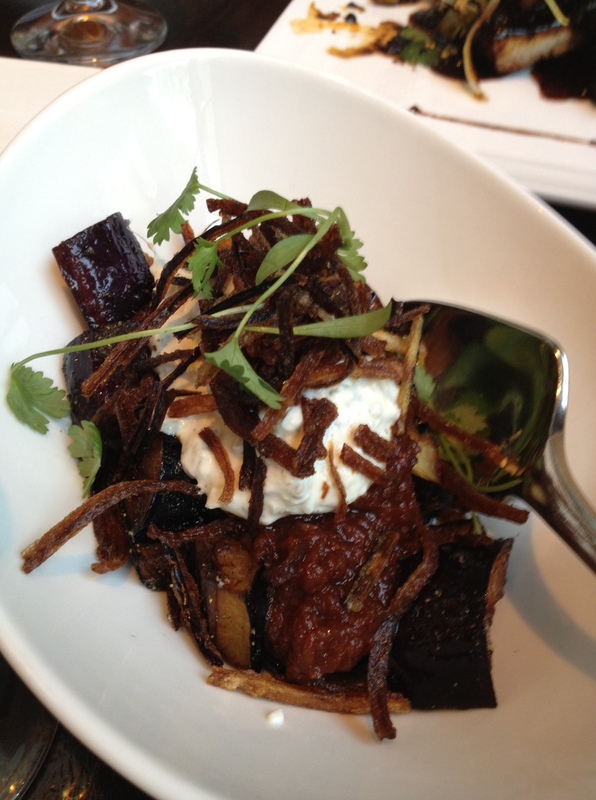 – Chinese Eggplant – thick cuts of eggplant “fries” paired with fennel raita and tomato sambal. It’s creamy and flavorful. – Dan Dan Noodles – a spicy dry noodles dish! Perfectly cooked noodles topped with a mixture of ground kurobuta pork, sesame, preserved mustard greens, Sichuan peppercorns and peanuts. Mix this baby together and it’s a guarantee flavor fest of spicy goodness. – Steamed Black Cod – a hearty cod fillet in a spicy citrus broth. 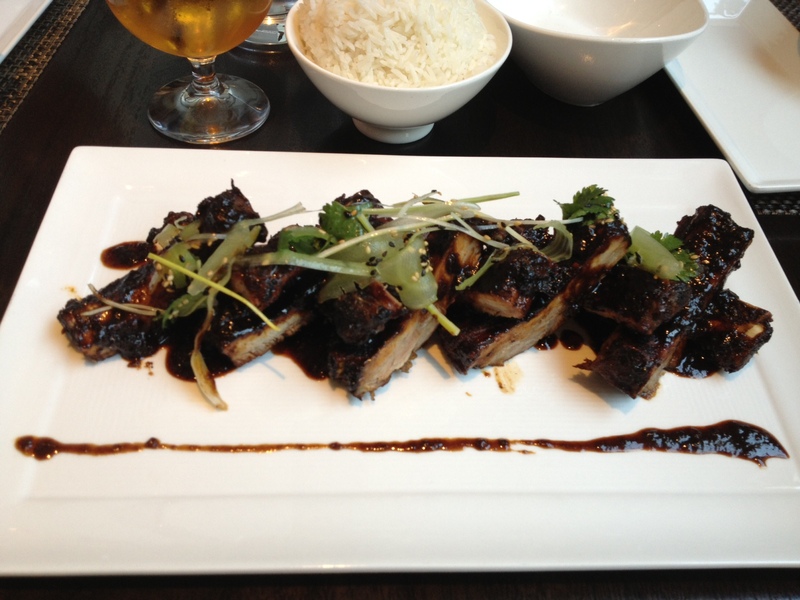 – Kurobuta pork ribs – Finger-licking good status. Pork ribs flavored with spicy chicory coffee bbq sauce. Service was attentive and professional. My eyes lit up when she said a dessert trio was included with our meal. Dessert to my ears! The restaurant space is unique–the outdoor, fire-lit patio to the slanted doors to the Asian-inspired bathroom. 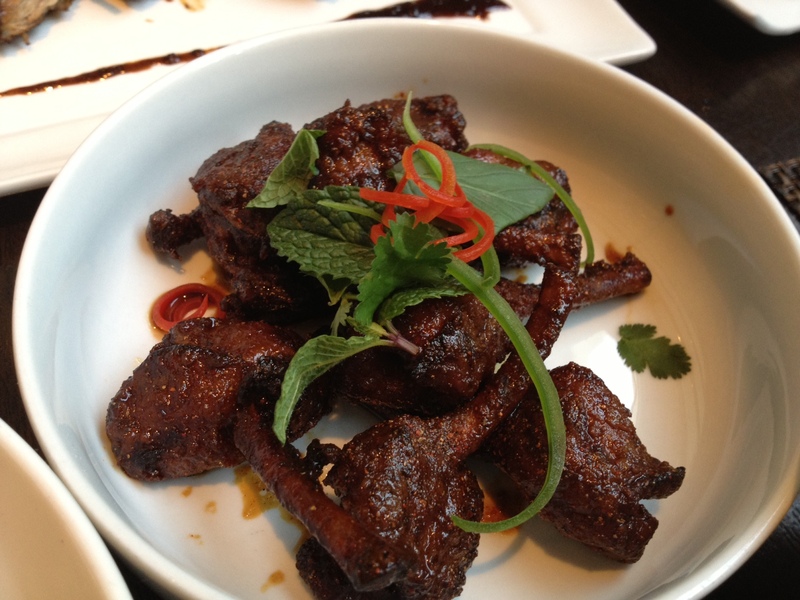 Lukshon (3239 Helms Ave., Culver City, CA 90232 | (310) 202-6808). Located in Culver City along Helms Ave. btwn Venice and Washington Blvd. Thanks for introducing me to this amazing place. I went twice on one day as well 😉 The chicken pops and pork ribs are my favorite. I want to be there now.